Talk about a dream client: Charlotte-based Firebirds Wood Fired Grill restaurants serve fantastic, wood-grilled steak, seafood and casual fare in attractive surroundings to legions of fans in several states. The staff exude energy and the leadership has a clear vision. So when this polished casual concept asked us to bring its brand up to the same level as the rest of the operation, we leapt at the opportunity. The Firebirds logo, bearing the “Spark Something®” tagline created by Supervox. Interior spreads from the Company Overview communicated the integrity of the concept, the quality of the management team, and the soundness of Firebirds’ growth strategy. Seasonal features are communicated via web banners, table tents, eblasts and TV screen displays. Posters promote a wide variety of offerings and events, and can be reformatted to serve as check presenter cards, emails and ads. A “marquee” poster for Firebirds depicts its hand-cut, bacon-wrapped filet. These table tents promoted proprietary craft cocktails and Happy Hour for Firebirds’ FIREBAR®. The popularity of Firebirds gift cards led us to create an entire family of them for seasonal and special occasion gift giving. Fresh designs are regularly added and older ones cycled out. We also created a series of greeting cards for servers to give to guests who were celebrating a special occasion. 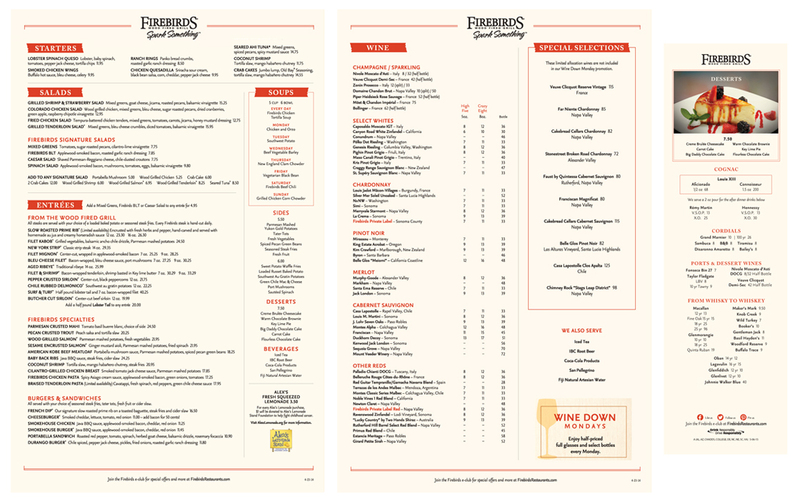 The challenge presented by the Firebirds menu: How to organize a large number of offerings in a way that maximized legibility and navigability. Supervox has been an ideal partner for a fast-growing, entrepreneurial concept like Firebirds Wood Fired Grill. Their brand work for us has been invaluable, and their deep experience in the hospitality industry makes for a very efficient working relationship. Whatever we throw at them, they’re able to handle – with unflappability, competence and insight.